As promised, the best sourdough bread I have ever made - dare I say it may be the best bread I have ever baked. Really, this bread was perfect - super thick crunchy crust on the outside, soft and chewy on the inside with a bit of sweetness from the dates. 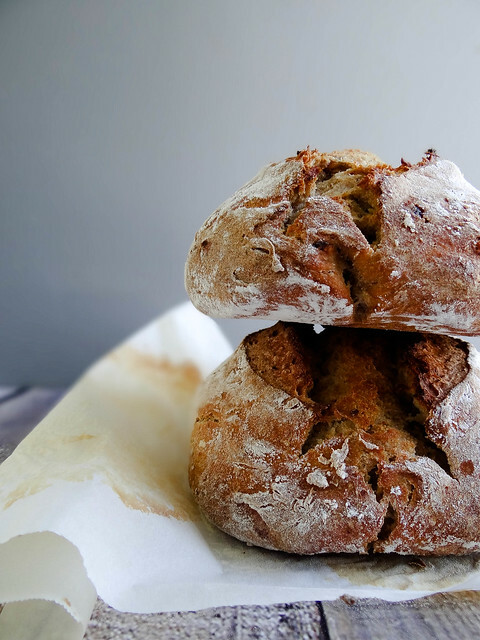 Making this bread takes a bit of effort, but is so worth the time. I was able to make this on Sunday morning, in between rises/resting I would set a timer for 30 minutes and clean the kitchen, fold a load of laundry or watch an episode of Sister Wives...I can't believe I just admitted I watch Sister Wives - it is so interesting though! The main bulk of the dough is mixed together the night before and allowed to rise overnight. Active time the following morning is limited, you simply need to ensure you are around every 30 minutes to fold and reshape the loaves a total of 3 times (90 minutes) + 45 minutes of bake time. Folding and reshaping the loaves is easy - simply fold each loaf into a letter, reshape seam side down and allow to rise for 30 minutes- repeat two additional times for a total of 3 reshaping/resting periods. The folding creates structure and traps air in between the layers of dough creating amazing texture and softness. After the final resting period, the bread is baked in a pre heated 375* oven for 45 minutes. A sheet pan is placed on the lower rack in the oven during pre heating. When the bread is placed in the oven for baking, a few ice cubes plus a 1/2 cup of water is dropped onto the sheet pan - this will create steam which in turn helps create amazing thick crusted loaves of bread. Originally I had planned to add rosemary to the dough...however I got sidetracked and completely forgot. 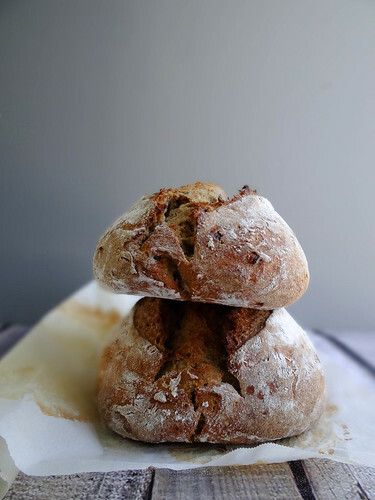 I loved the added sweetness from the dates, rosemary would make this bread even more exceptional. 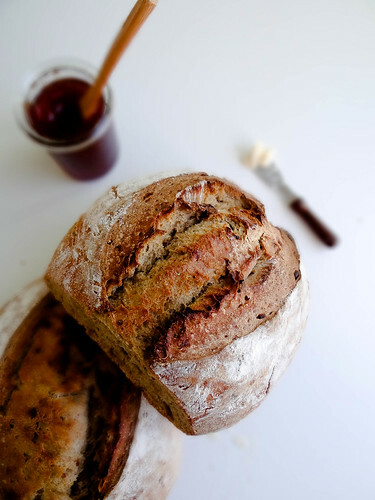 I plan to make another batch of bread this weekend, this time I promise myself not to forget the rosemary! Justin and I enjoyed this bread slathered with homemade strawberry jam , on the grille outside (my fave! ), toasted in the oven with butter - really we just inhaled enjoyed every last crumb. The second loaf went to my Mom, who loves bread just as much as I do. 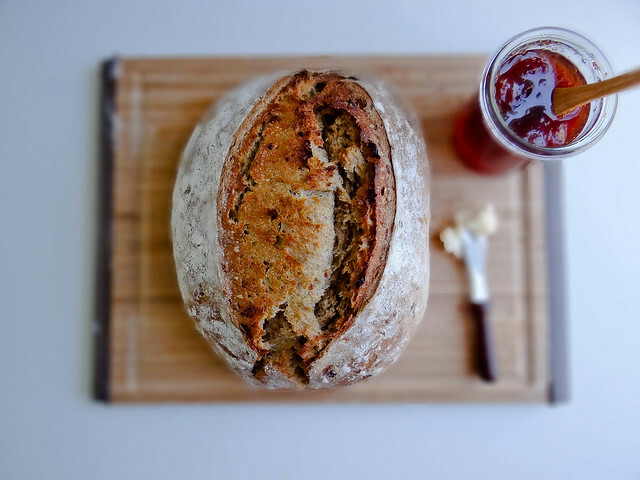 Do you have a favorite version of Sourdough Bread you would like to share or recipes you love making with your sourdough starter? Mix sourdough starter, 2 cups water and 3 cups flour in a large bowl. Mix well; cover with a dish towel and let rise 8 hours or overnight. The next morning, pit & soak your dates in boiling water for about 10 minutes. Add softened dates and 1/2 cup water to a food processor and process until fairly smooth - about 30-45 seconds. Add the pureed dates & 2 cups of rye flour to the dough and mix well. Turn dough out onto a well floured surface, knead in the remaining 2 cups of all purpose flour - more if needed to prevent dough from sticking to the surface hands. Knead dough until you have a soft, smooth dough ball. Divide dough into 2 equal halves. 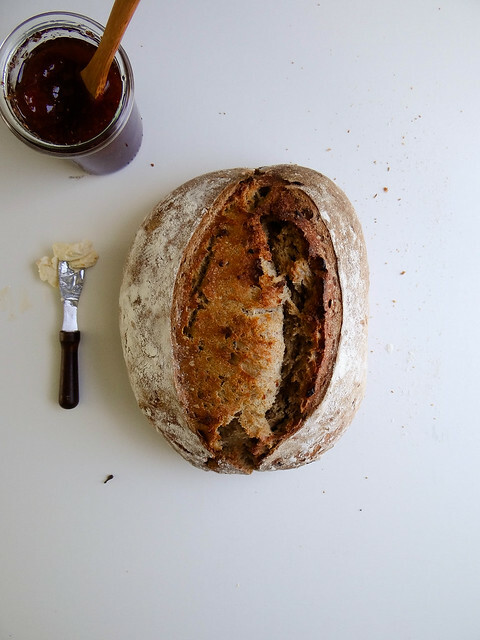 Shape each half into a loaf (round, elongated round- whatever suites your fancy). 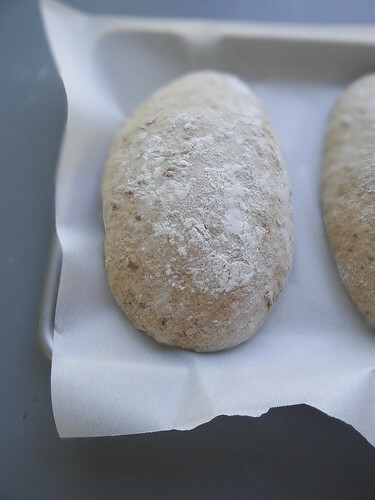 Place each loaf on a parchment lined baking sheet - dust with flour and cover with a clean dish towel. Place in a warm area free of drafts for the first rise- 30 minutes. After rise #1, with a gentle hand, fold each loaf like you would a letter onto (you want to try to avoid "deflating" the bread, your are trying to create pockets of air). Place the seam side down - dust with additional flour, cover to rise for an additional 30 minutes in the same location as the first rise. After rise #2 - repeat and allow for the 3rd and final rise of 30 minutes. During the 3rd rise , position the racks so one rack is close to the bottom of the oven with the second one right above so you have enough room to slide in your loaves of bread - pre heat the oven to 375F. If using a baking stone, place the stone in the oven to pre heat along with a sheet pan for the water/ice cubes. After the final rise, dust the loaves with flour- using a sharp knife quickly slash each loaf down the center or in whatever fashion makes you happy (x, diagonal or in a grid pattern are all good choices). 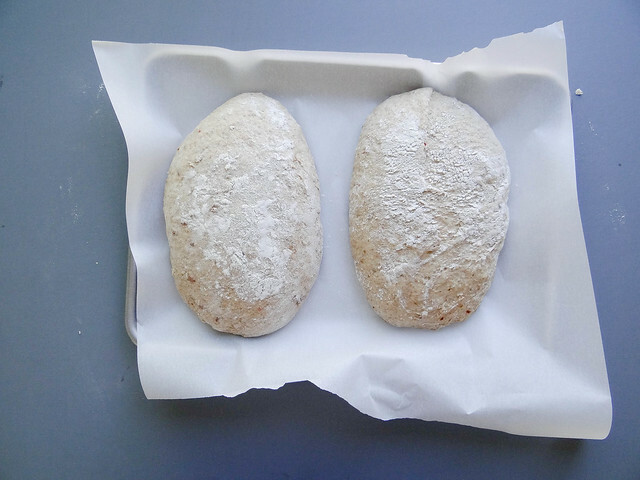 Transfer the loaves of bread and parchment directly to the baking stone or pan you are using. Quickly add 3 ice cubes and a 1/2 cup of water to the lower most pan, this will create steam for that nice thick crust. Bake your bread for 45 minutes or when the bottom of each loaf is tapped it sounds hollow. I baked mine for exactly 45 minutes. Remove from the oven and allow to cool a minimum of 15 minutes prior to slicing. 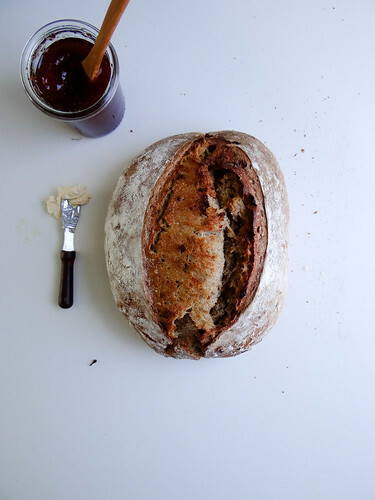 Loooove the look of this bread! Yum! sometimes i REALLY miss eating bread(the real kind). this is one of those times. sourdough bread bowls filled with soup was an all time fave of mine. Yum! I am such a sucker for bread. I can go without cookies, cakes, ice cream- no problem, but bread? Hide the loaf. 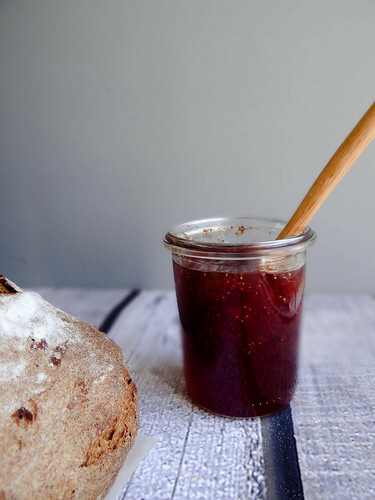 Especially with fresh summer jam, there is nothing like homemade sourdough bread! This looks delicious! Im confused. It says add 5 cups flour, then later it says add 2 cups. So there is 7 cups total? I hope you get the answer to your question because I want to make this bread too! I'm thinking maybe she meant 3 cups of AP Flour for the first rise, instead of 5 cups. Really does look delicious! Wow - gorgeous loaves! 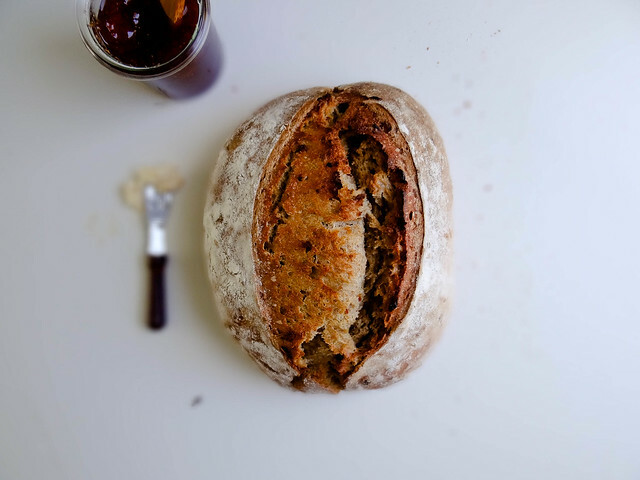 I love love love the idea of putting dates in sourdough... I have to do that next time. I wish I had a slice right now. Yum! 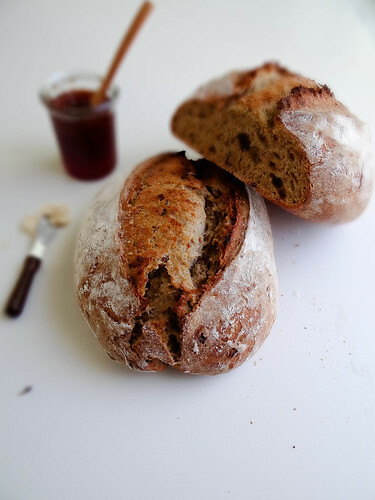 Your sourdough bread looks truly authentic and cute :) Thanks for the recipe and nice pictures. Lovely! I can't get enough sourdough bread. Yours looks perfect. This looks just heavenly! I'm like you, any kind of bread is great, but the kinds that are soft and chewy on the inside and crusty on the outside are my FAVES! It's a good thing I just bought a bunch of rye flour. Girl, you are on a roll! I just can't wait to try this, look at the cracking on that beautiful loaf! Wow, this bread really does look perfect! 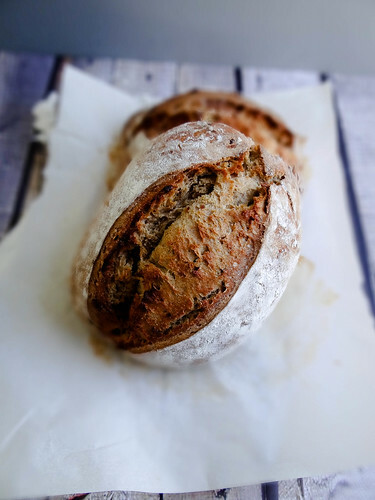 I'm usually not a fan of sourdough bread, but I think with rye flour and dates added, I would definitely like this version! Glad all the time and effort you put into it with making your own starter was worth it! That's it. I'm making sourdough now. You've inspired me. I totally need this bread in my life! Where do you get the sourdough starter? 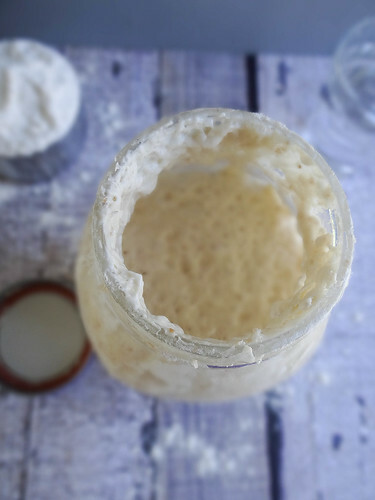 You can start your own by following these simple instructions - http://sundaymorningbananapancakes.blogspot.com/2013/05/diy-kitchen-series-sourdough-starter.html - good luck! I am uncertain the exact quantity- however the dates also add moisture and body to the bread, I don't think the date extract will work in the same application in place of actual dates. If dates are hard to come by a better substitute would be raisins // i would use about 2 cups of raisins soaked in the same manner of as the dates. I hope this helps, thanks for stopping by! I've made it and turned out successful. Tons of thanks for the recipe. This is my second attempt in baking sourdough bread, my first was not succeed. So I'm pretty happy. Can you please post your Sour dough Starter recipe or a link to your favourite recipe.